"Leyden" redirects here. For other uses, see Leyden (disambiguation). Leiden (/ˈlaɪdən/, Dutch: [ˈlɛi̯də(n)] ( listen); in English and archaic Dutch also Leyden) is a city and municipality in the province of South Holland, Netherlands. 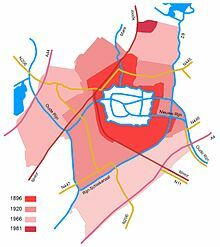 The municipality of Leiden had a population of 123,856 in August 2017, but the city forms one densely connected agglomeration with its suburbs Oegstgeest, Leiderdorp, Voorschoten and Zoeterwoude with 206,647 inhabitants. The Netherlands Central Bureau of Statistics (CBS) further includes Katwijk in the agglomeration which makes the total population of the Leiden urban agglomeration 270,879, and in the larger Leiden urban area also Teylingen, Noordwijk, and Noordwijkerhout are included with in total 348,868 inhabitants. Leiden is located on the Oude Rijn, at a distance of some 20 kilometres (12 miles) from The Hague to its south and some 40 km (25 mi) from Amsterdam to its north. The recreational area of the Kaag Lakes (Kagerplassen) lies just to the northeast of Leiden. A university city since 1575, Leiden has been one of Europe's most prominent scientific centres for more than four centuries. Leiden is a typical university city, university buildings are scattered throughout the city and the many students from all over the world give the city a bustling, vivid and international atmosphere. Many important scientific discoveries have been made here, giving rise to Leiden's motto: ‘City of Discoveries’. The city houses Leiden University, the oldest university of the Netherlands, and Leiden University Medical Center. Leiden University is one of Europe's top universities, with thirteen Nobel Prize winners. It is a member of the League of European Research Universities and positioned highly in all international academic rankings. It is twinned with Oxford, the location of the United Kingdom's oldest university. Leiden University and Leiden University of Applied Sciences (Leidse Hogeschool) together have around 35,000 students. Modern scientific medical research and teaching started in the early 18th century in Leiden with Boerhaave. Leiden flourished in the 16th and 17th century. At the close of the 15th century the weaving establishments (mainly broadcloth) of Leiden were very important, and after the expulsion of the Spaniards Leiden cloth, Leiden baize and Leiden camlet were familiar terms. In the same period, Leiden developed an important printing and publishing industry. The influential printer Christoffel Plantijn lived there at one time. One of his pupils was Lodewijk Elzevir (1547–1617), who established the largest bookshop and printing works in Leiden, a business continued by his descendants through 1712 and the name subsequently adopted (in a variant spelling) by contemporary publisher Elsevier. In 1572, the city sided with the Dutch revolt against Spanish rule and played an important role in the Eighty Years' War. Besieged from May until October 1574 by the Spanish, Leiden was relieved by the cutting of the dikes, thus enabling ships to carry provisions to the inhabitants of the flooded town. 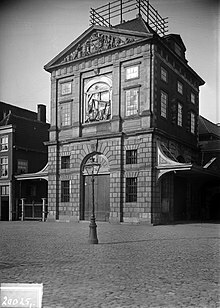 As a reward for the heroic defence of the previous year, the University of Leiden was founded by William I of Orange in 1575. Yearly on 3 October, the end of the siege is still celebrated in Leiden. Tradition tells that the citizens were offered the choice between a university and a certain exemption from taxes and chose the university. The siege is notable also for being the first instance in Europe of the issuance of paper money, with paper taken from prayer books being stamped using coin dies when silver ran out. 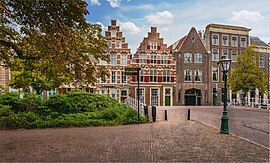 Leiden is also known as the place where the Pilgrims (as well as some of the first settlers of New Amsterdam) lived (and operated a printing press) for a time in the early 17th century before their departure to Massachusetts and New Amsterdam in the New World. In the 17th century, Leiden prospered, in part because of the impetus to the textile industry by refugees from Flanders. While the city had lost about a third of its 15,000 citizens during the siege of 1574, it quickly recovered to 45,000 inhabitants in 1622, and may have come near to 70,000 circa 1670. During the Dutch Golden Era, Leiden was the second largest city of Holland, after Amsterdam. Particularly due to the work by Herman Boerhaave (1668–1738), it played a crucial role in the establishment of modern chemistry and medicine. From the late 17th century onwards Leiden slumped, mainly due to the decline of the cloth industries. 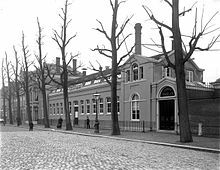 In the beginning of the 19th century the baize manufacture was altogether given up, although industry remained central to Leiden economy. This decline is painted vividly by the fall in population. The population of Leiden had sunk to 30,000 between 1796 and 1811, and in 1904 was 56,044. From the 17th to the early 19th century, Leiden was the publishing place of one of the most important contemporary journals, Nouvelles Extraordinaires de Divers Endroits, known also as Gazette de Leyde. On 12 January 1807, a catastrophe struck the city when a boat loaded with 17,400 kilograms (38,360 pounds) of gunpowder blew up in the middle of Leiden. 151 persons were killed, over 2,000 were injured and some 220 homes were destroyed. King Louis Bonaparte personally visited the city to provide assistance to the victims. Although located in the centre of the city, the area destroyed remained empty for many years. In 1886 the space was turned into a public park, the Van der Werff park. In 1842, the railroad from Leiden to Haarlem was inaugurated and one year later the railway to Den Haag was completed, resulting in some social and economic improvement. Perhaps the most important piece of Dutch history contributed by Leiden was the Constitution of the Netherlands. Johan Rudolf Thorbecke (1798–1872) wrote the Dutch Constitution in April 1848 in his house at Garenmarkt 9 in Leiden. Leiden's reputation as the "city of books" continued through the 19th century with the establishment of publishing dynasties by Evert Jan Brill and Albertus Willem Sijthoff. Sijthoff, who rose to prominence in the trade of translated books, wrote a letter in 1899 to Queen Wilhelmina regarding his opposition to becoming a signatory to the Berne Convention for the Protection of Literary and Artistic Works. He felt that international copyright restrictions would stifle the Dutch publishing industry. Leiden began to expand beyond its 17th-century moats around 1896 and the number of citizens surpassed 50,000 in 1900. After 1920, new industries were established in the city, such as the canning and metal industries. During World War II, Leiden was hit hard by Allied bombardments. The areas surrounding the railway station and Marewijk were almost completely destroyed. The two branches of the Oude Rijn, which enter Leiden on the east, unite in the centre of the city. The city is further intersected by numerous small canals with tree-bordered quays. On the west side of the city, the Hortus Botanicus and other gardens extend along the old Singel, or outer canal. The Leidse Hout park, which contains a small deer park, lies on the northwest border with Oegstgeest. The Van der Werf Park is named after the mayor Pieter Adriaansz. van der Werff [nl], who defended the city against the Spaniards in 1574. The city was beleaguered for months and many died from famine. The open space for the park was formed by the accidental explosion of a ship loaded with gunpowder in 1807, which destroyed hundreds of houses, including that of the Elsevier family of printers. Because of the economic decline from the end of the 17th until the middle of the 19th century, much of the 16th- and 17th-century city centre is still intact. It is the second largest 17th-century town centre in the Netherlands, the largest being Amsterdam's city centre. A hundred buildings in the centre are decorated with large murals of poetry, part of a wall poem project active from 1992, and still ongoing. At the strategically important junction of the two arms of the Oude Rijn stands the old castle de Burcht, a circular tower built on an earthen mound. The mound probably was a refuge against high water before a small wooden fortress was built on top of it in the 11th century. The citadel is a so-called motte-and-bailey castle. 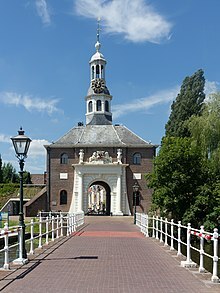 Of Leiden's old city gates only two are left, the Zijlpoort and the Morspoort, both dating from the end of the 17th century. Apart from one small watch tower on the Singel nothing is left of the town's city walls. Another former fortification is the Gravensteen. Built as a fortress in the 13th century it has since served as house, library and prison. Presently it is one of the University's buildings. The chief of Leiden's numerous churches are the Hooglandse Kerk (or the church of St Pancras, built in the 15th century and containing a monument to Pieter Adriaansz. van der Werff) and the Pieterskerk (church of St Peter (1315)) with monuments to Scaliger, Boerhaave and other famous scholars. From a historical perspective the Marekerk is interesting too. Arent van 's Gravesande designed that church in 1639. Other fine examples of his work in Leiden are in the Stedelijk Museum De Lakenhal (the municipal museum of fine arts), and the Bibliotheca Thysiana. 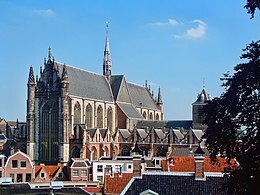 The growing city needed another church and the Marekerk was the first Protestant church to be built in Leiden (and in Holland) after the Reformation. It is an example of Dutch Classicism. In the drawings by Van 's Gravesande the pulpit is the centrepiece of the church. The pulpit is modelled after the one in the Nieuwe Kerk at Haarlem (designed by Jacob van Campen). The building was first used in 1650, and is still in use. The Heilige Lodewijkkerk is first catholic church in Leiden that was built after the Reformation. This church was given to the Catholics after the gunpowder explosion in 1807, which killed 150 inhabitants and destroyed a large part of the city centre. The 'Waalse Kerk' (Breestraat 63) was originally part of the Katharina Hospital. In 1584 it became the church of Protestant refugees from the Southern Netherlands (Brugge) and France. Later churches in the centre include the St. Joseph in expressionistic style. The city centre contains many buildings that are in use by the University of Leiden. The Academy Building is housed in a former 16th-century convent. Among the institutions connected with the university are the national institution for East Indian languages, ethnology and geography; the botanical gardens, founded in 1587; the observatory (1860); the museum of antiquities (Rijksmuseum van Oudheden); and the ethnographical museum, of which P. F. von Siebold's Japanese collection was the nucleus (Rijksmuseum voor Volkenkunde). This collection is now housed in a separate museum called the SieboldHuis. The Bibliotheca Thysiana occupies an old Renaissance building of the year 1655. It is especially rich in legal works and vernacular chronicles. Noteworthy are also the many special collections at Leiden University Library among which those of the Society of Dutch Literature (1766) and the collection of casts and engravings. 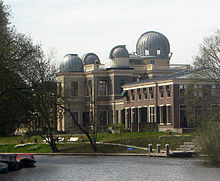 In recent years the university has built the Leiden Bio Science Park at the city's outskirts to accommodate the Science departments. Heilige Geest Weeshuis (a former Holy Spirit Orphanage) – a complex of 16th century buildings. Pesthuis, which was built during 1657–1661 at that time just outside the city for curing patients suffering the bubonic plague. However, after it was built the feared disease did not occur in the Netherlands anymore so it was never used for its original purpose. The building has been used as a military hospital, prison, national asylum and army museum. It now serves as the entrance of Naturalis, one of the largest natural history museums in the world. Bus transport in Leiden is provided by Arriva. Leiden is on the planned route of the RijnGouweLijn, the Netherlands' first Light rail project. This project has, however been shelved for the foreseeable time. William II, 1228–1256, count of Holland, later also king of Germany. Peter Blomevenna, 1466-1546, Carthusian author. Lucas van Leyden, 1494–1533, engraver and painter. John of Leiden, 1509–1536, leader of the Anabaptist Münster Rebellion. Charles de L'Écluse, 1526–1609, botanist, director of Leiden's Hortus Botanicus, where his cultivation of tulips led to the Dutch tulip industry. Ludolph van Ceulen, 1540–1610, mathematician, computed Pi. Willebrord Snell, 1580–1626, astronomer and mathematician. William Bradford, 1590–1657, pilgrim, leader of the American Plymouth Colony in Massachusetts. Jan van Goyen, 1596–1656, painter. Rembrandt van Rijn, 1606–1669, painter. Pieter de Ring, ca 1615–1660, painter. Hendrick van der Burgh, 1627–after 1664, painter. Herman Boerhaave, 1668–1738, humanist and physician. Johann Bachstrom, 1688–1742, writer, scientist and Lutheran theologian. Bernhard Siegfried Albinus, 1697–1770, anatomist. Gottfried van Swieten, 1733–1803, diplomat, friendship and collaboration with several great composers. Philipp Franz Bathasar von Siebold, 1796–1866, physician, collector, 'Japanologist'. Johannes Diderik van der Waals, 1837–1923, physicist. Jan Elias Kikkert, 1843–1925, watercolorist. Heike Kamerlingh Onnes, 1853–1926, physicist. Willem Einthoven, 1860–1927, physician, physiologist. Willem de Sitter, 1872–1934, mathematician, physicist, astronomer. Albert Einstein, 1879–1955, lecturer/researcher at Leiden University, various dates between 1916 and 1930. Theo van Doesburg, 1883–1931, painter, architect, writer. Jan Hendrik Oort, 1900–1992, astronomer. Marinus van der Lubbe, 1909–1934, accused of setting fire to the Reichstag in Berlin. Nina Foch, 1924–2008, actress/ acting teacher. Jouke de Vries, 1960, professor at Leiden University and runner-up candidate for the PVDA elections in 2002 (lost to Wouter Bos). Armin van Buuren, 1976, producer/DJ, DJ Magazine's # 1 DJ 2007–2010 & 2012. Dyro, 1992, producer/DJ, DJ Magazine's #30 DJ 2013, #27 DJ 2014 & 2015 and #93 DJ 2016. Buurtpoes Bledder, 2011–2013, Cat covered by national media for his exploits around the city. The coat of arms of Leiden is two red keys, crossed in an X-shape on a white background. These keys are the Keys of Heaven held by St. Peter, for whom a large church in the city centre is named. Because of this coat of arms, Leiden is referred to as the "Sleutelstad" ("the key city"). For a time Leiden held the title "The Coldest Place on Earth" because of the developments in cryogenics in a laboratory there. Heike Kamerlingh Onnes (1913 Nobel prize winner in physics) liquefied helium for the first time (1908), and later managed to reach a temperature of less than one degree above Absolute zero. The Norwegian cheese "nøkkelost" ("key cheese") is named after the keys in coat of arms of Leyden, as it is a variation of Leyden cheese. Leyden High School District 212 in Franklin Park, Illinois, USA. Leiden scale, for measuring extreme low temperatures. Factor V Leiden is named after the city of Leiden where it was discovered in 1994.
zo VeeL WI CVnsten WensChen. Zorg en Zekerheid Leiden is the basketball club of Leiden. In 2011 and 2013 they won the National Title, in 2010 and 2012 the National Cup and in 2011 and 2012 the National Super Cup. The club also played in the FIBA EuroChallenge and reached the Second Round (Best 16) in 2011/2012. 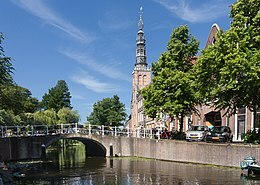 Wikivoyage has a travel guide for Leiden. ^ "College van burgemeester en wethouders" [Board of mayor and aldermen] (in Dutch). Gemeente Leiden. Archived from the original on 8 July 2013. Retrieved 8 August 2013. ^ "Postcodetool for 2312AT". Actueel Hoogtebestand Nederland (in Dutch). Het Waterschapshuis. Archived from the original on 21 September 2013. Retrieved 8 August 2013. ^ John E. Sandrock. "Siege Notes - Windows To The Past" (PDF). thecurrencycollector.com. Retrieved 9 June 2016. ^ "The New York Genealogical and Biographical Society – Access Denied". Newyorkfamilyhistory.org. Retrieved 11 June 2010. ^ "The Pilgrim Press". Pilgrimhall.org. 18 May 2005. Archived from the original on 3 May 1999. Retrieved 11 June 2010. ^ "The Dutch Door to America". Americanheritage.com. April 1999. Retrieved 28 November 2011. ^ Popkin, Jeremy D. (1 October 1989). News and Politics in the Age of Revolution: Jean Luzac's "Gazette de Leyde". Ithaca, NY: Cornell University Press. ISBN 9781501700712. 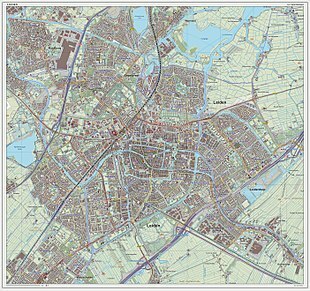 ^ "Leiden" (PDF). Amazing Holland. Retrieved 31 December 2018. ^ "History: Leiden, city of books". Burgersdijk & Niermans. Retrieved 29 August 2010. ^ "10 Best Spots in Leiden". visitleiden.nl. 18 March 2016. ^ "404". lodewijkparochie.nl. Archived from the original on 22 December 2015. Retrieved 9 June 2016. ^ Hein van Woerden (eindred. ): Lodewijk in Leiden. 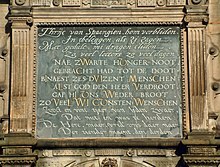 Geschiedenis van kerk en orgel. Leiden, Parochie van de Heilige Lodewijk, 2005. ^ Gallery, Saatchi. "Naturalis – National Museum of Natural History :: The Saatchi Gallery". www.saatchigallery.com. Retrieved 22 March 2016. ^ Busways (5 July 2013). "English – Arriva". Archived from the original on 5 December 2012. ^ "Dood van Bledder dompelt Leiden in rouw". De Telegraaf. 9 August 2013. Retrieved 9 August 2013. ^ "Leiden Information". Orientation Week. Retrieved 5 February 2015. ^ Handbook to Holland (7th edition). Ward Lock. 1925. p. 92. Wikimedia Commons has media related to Leiden. This page was last edited on 25 April 2019, at 10:57 (UTC).